Here's lighthouse no. 2. Not quite finished, but well underway. I also have a query, for those of you who know about these things. I have been using Google's Picasa programme for photo editing; it's not sophisticated but then mostly I'm just cropping out the mess, or my feet, or the cats, and tweaking the colours if they look completely wrong. However they are now phasing this out. I know Photoshop is the big name, but it's a lot to pay to do my simple bits, so any recommendations would be gratefully received. Linking up with Confessions of a Fabric Addict for Whoop Whoop Friday and NinaMarie for Off the Wall. On my Surface I'm using the photo editing software that showed up when I upgraded to Windows 10. Nothing sophisticated, but better than what I had with Windows 8. My laptop has software that came with the camera. PS: love the cloudy background! Kaja, you will still be able to use Picasa if you have downloaded the program onto your computer. Picasa just won't have an online presence. Another program you might find helpful, which is also free, is Irfanview. It has more editing options than Picasa and I think it's pretty easy to learn and use. Your lighthouses are amazing! I can't wait to see what you do next. that's news about Picasa - bugger! 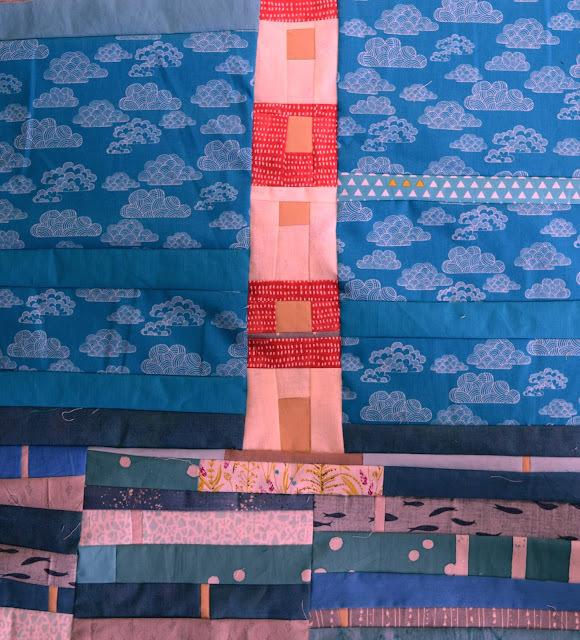 Love the lighthouse and adore the fabric collage its living in! I love this second lighthouse! Photo editing, I use Photoshop Elements which is the second tier down if you like of the Photoshop programmes. I have had mine on the computer for quite a few years now so it's not the latest version by any means. Great for cropping, altering size and so on and lots of other gizmos on there. I still have iPhoto which comes with the iMac and is very basic but I have my settings so that all downloads go into iPhotos and from there I can edit as I wish in Elements. I use Corel Paintshop Pro for photo editing. It does a fair number of things, and when I bought it I only paid $40 -- a few years ago now. It's a download, so easy to set up. My main complaint is the lack of documentation, but I expect Photoshop would have the same problem, if not worse. Good luck! Kaja, thanks for sharing about Picasa, I've used it for years now, bummer! I have used picmonkey for quick stuff. I'vw also used Photobucket for some fancy stuff, but each photo is automatically shared in their library, so if its something secret, then I'm hooped. This is so lovely, the clouds and your lighthouse, really cool exploration! Kaja, have you ever seen when the setting sun makes things have a pink glow? Your Happisburgh lighthouse looks like it is being lit up by the setting sun! PicMonkey is absolutely great for simple photo editing, but you can use it for simple design elements too. If you like the Photoshop idea but not the price, try Gimp. It's completely free and you just download it for whatever type of OS you're using. I've used it for ages, but have just got Photoshop CC (66% off because Kim could get it at a student rate - he's useful for something then!!!) and there are a lot of similarities. Love the clouds and the fishes in this version Kaja! I never really collect these type of prints, but maybe I should - although I'm not sure I'd do them as much justice as you. This is going to be such a fun quilt...I think you should make it big enough for the wee ones to enjoy! I look forward to seeing the two lighthouses side by side - are they both a similar size? Another awesome light house so quickly? Will there be more? I love them. For years I've used Adobe Photoshop Elements. 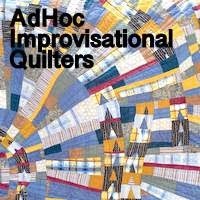 I got a new laptop with Windows 10 and it worked for about a month and I got some Windows updates and my Photoshop Elements, and Microsoft Office programs quilt working. Microsoft support spent four hours on my laptop getting Office to work but Photoshop Elements still doesn't work and I don't have time or the willingness to fool around with it. So I downloaded Picasa and started using it only to find it will be unsupported. I figure I will use it unsupported for as long as I can and then figure out what's wrong with Photoshop Elements or use something else. I love the warm glow on your lighthouse. Your second lighthouse looks fabulous with the cloud fabric.